Happy Holiday Greetings! Just made it in time to wish everyone a Happy New Year! Although it's technically a few days away still from New Year, but everyone's already in a holiday mood, and before we know it, Christmas is already over! What I like best about the year end holidays is that both Christmas and New Year is so close together, that we are constantly in that holiday mood for that entire week, and have more time to be with our family and loved ones. 2010 gone by rather quickly! It was a year of change and new challenges. The new year will bring even more new challenges, but I hope to embrace all of them and more importantly, to enjoy the journey. I don't really have new year resolutions, but one which I really want to achieve is to provide great valuable miniature contents on this blog in the next year, so this is something I will work hard in the next year! Thank you for staying and reading my blog throughout the year, I'm appreciative of all the comments and the friends that I made through here. I was experimenting with the miniature profiteroles I made a while ago, when I thought, what if I made them into a wearable ring? So I did just that, and started decorating it. Then I decided to add in a rose, and made use of the fuchsia gerbera daisies. I thought it was a perfect combination! I made a macaron ring last weekend. Using the colours I so lovingly adore, I made it into a feminine, elegant macaron ring. Definitely an eye catcher wearing it! See it on my hand! Every year, I try to come up with a new christmas miniature art piece. The idea of a 1:12 scale christmas train came up 2 years ago, but back then, for several reasons, I did not have the chance to attempt it. The reasons include not having enough time, not having the skills! (it is true), and I just have not figured out how to go about realizing it. I started working on this design mid July this year. 2 years ago, I started my research on gingerbread christmas trains. 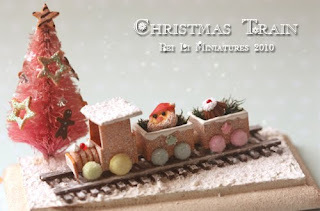 Just go to Google and you will find many images of the real gingerbread christmas trains. I did another research again this year, and spent some time looking at images and figuring out how to adapt it into a 1:12 scale miniature piece. At the same time for me, it's also about injecting my personal style through the art piece. There were many considerations, but first I had to come up with a design. Some people prefer drawing various designs on a sketch book. I work a different way though. I dive right in. Nothing beats just getting down and experimenting it. Because there wasn't a miniature "template" to begin with, I just create it from scratch, based on the image of my ideal miniature train in mind. What you see in the photo below is the result of my first piece. The only changes I did was the decoration of the train. After I assembled the train, I sent several photos to a few friends showing them my new design, and I spent more time finalizing the decorations. I changed several things along the way and am pleased with the final result! Hi all, I have been featured by Paper Cakes Finds...and I have an exclusive giveaway over there. To enter the giveaway, please read the instructions over there now! This closes on 20 Dec 2010. But I just wanted to let you know that I'm offering FREE SHIPPING on selected items on my etsy store! Check out the flowers and cupcakes! Take advantage of this to combine shipping with other products on my store too! This offer is valid till 18 Dec 2010. Also, I will be listing some fine, handpicked 1:12 scale miniature treasures on my own website.